Bubbles, pinholes and foam are similar defects. 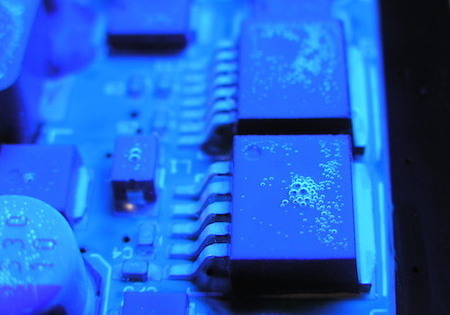 Bubbles are trapped pockets of air within the conformal coating. Pinholes are burst bubbles that reach to the surface of the PCB from the substrate. 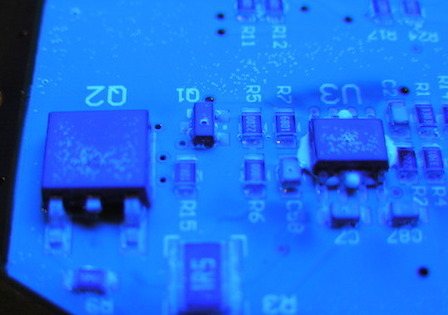 Premature Drying: When applying the conformal coating the wet film surface can skin over, entrapping solvents under the surface that can bubble or burst out. Coating too thick: Applying multiple layers of coating can entrap solvent. Solvent popping is an application phenomenon that occurs when a second coat is applied without sufficient flash time of the first. Solvent, which is still trying to outgas, is trapped underneath the second coat, and as it migrates to the top it bursts, leaving a small crater. If the coating is applied too thick or too viscous any bubbles that are created in the process of application can become entrapped in the coating before they settle out. Air entrapment: Air entrapped under components by the coating process can be forced out during the drying / curing process and cause bubbles. Champagne: Pressure pots with conformal coating inside can absorb air which can manifest as champagne bubbles when applied. Wrong viscosity: Brush coating with too viscous a material or working the coating can cause bubbles. Too much pressure: Incorrect spray equipment or pressures can cause excessive bubbles & foam. 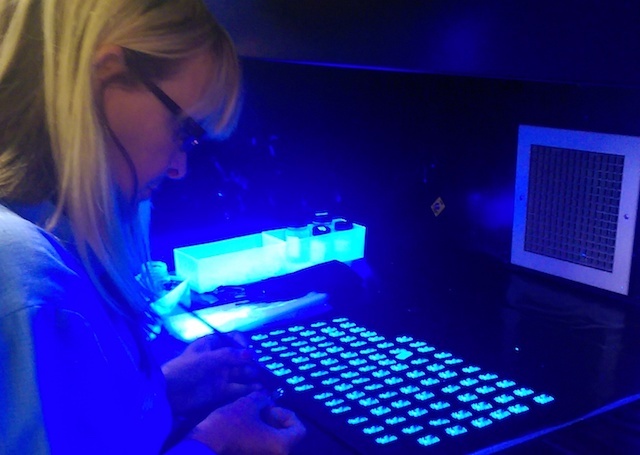 Correct Film Thickness: When applying the conformal coating ensure the wet film surface is not too thick. This is particularly important when spray coating. It is better to apply multiple thin layers than one thick layer. Also, check curing in case elevated temperature is causing the conformal coating to skin. Correct Drying: Ensure the individual coating layers are sufficiently dry before applying the next coating layer. This will avoid solvent popping. Change Technique: To avoid air entrapment under PCB components try (1) dipping slower into the conformal coating dip tank (2) adding a dwell time to allow penetration of the coating or (3) using a lower viscosity version of the conformal coating to under fill the area more effectively. Turn off Pressure: When using pressure pots with conformal coating inside try to avoid leaving the pots pressurised for long periods of time when not being used or avoid running the pressure pots more than 50% full and letting them stand. This will minimise the champagne effect in the coating. Blend the coating: When brush coating try to blend the coating so it flows easily and “flow” the material onto the PCB. Do not work the coating into the PCB as it creates bubbles. Adjust the Pressure: Reducing the pressure on spraying reduces the mechanical agitation and reduces bubbles.